Dollarama (TSX:DOL) stock has fallen meaningfully by about 15% since reporting its third-quarter results last week. Taking a step back, in the last 12 months the stock has corrected about 38%. Looking at an even bigger picture, despite the huge drop in the stock, a stock investment in Dollarama has actually returned about 18% per year in the last five years. In the period, the growth stock’s price-to-earnings ratio (P/E) contracted from about 25 to under 20, but the strong growth in the company still led to outsized returns. As Fool contributor David Jagielski discussed in his recent article on Dollarama, the stock continued to be depressed after reporting its third quarter results because the company’s growth has been tapering off. Additionally, Dollarama’s debt levels have been on the rise. 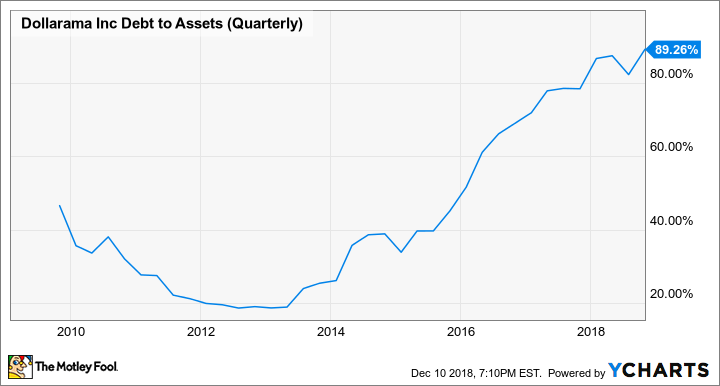 For example, its debt-to-assets ratio is at its all-time high. DOL Debt to Assets (Quarterly) data by YCharts. Change in Dollarama’s debt-to-assets ratio over time. Having high debt levels means there will be little wiggle room for the company to borrow to boost growth. If anything, it’ll be healthier for the company to consider reducing its debt levels as interest rates (and as a result, borrowing costs) increase. In the first nine months of the fiscal year, Dollarama sourced 56% of its purchases overseas. While Dollarama buys products from more than 25 countries, the majority of its overseas products come from China, for which it pays in U.S. dollars. So, foreign exchange fluctuations between the currencies that Dollarama deals with will change its cost of sales. In the period, Dollarama’s sales increased by 6.9%, but its cost of sales increased by 7.6%. It’s important to note that when Dollarama traded at the peak of about $56 per share in January, it traded at a P/E of almost 37. Stocks usually don’t stay at such a high multiple for long because high growth that supports high valuations don’t last for long. Dollarama’s five-year normal P/E is about 24.7. So, it’s a good starting point to research and consider Dollarama when it trades at a P/E of 24.7 or lower. Currently, at under $32 per share as of writing, Dollarama trades at a P/E of about 19.1, while analysts estimate the growth company will grow its earnings per share by about 12.7% per year on average over the next three to five years. So, the stock trades at a reasonable PEG ratio of about 1.5. Dollarama is a well-run company and enjoys higher margins than its U.S. peers with a recent net margin of about 15.7% compared to the U.S. peers’ roughly 7-7.6%. However, the stock is in a downward trend. Despite the stock now being oversold at current levels, interested investors should watch for consolidation in stock or buying action from the market for a safer entry point.